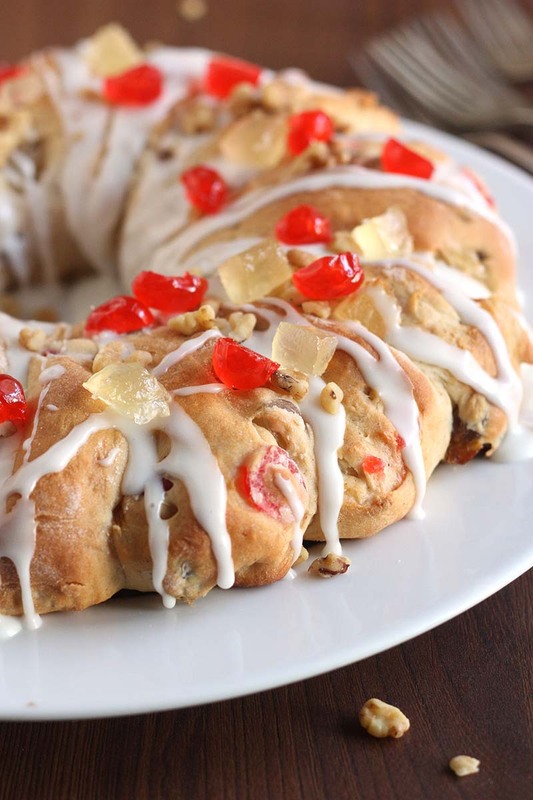 A frosted holiday yeast coffee cake filled with nuts and candied fruit. Use whatever candied fruit you prefer, such as pineapple, cherries, citrus peel, raisins or cranberries. Heat the butter and milk in a small saucepan over low heat until butter is melted. Remove and cool for about 5 minutes, until 110-115°F. Pour mixture into a large bowl and add the yeast, sugar and egg. Mix in 1½ cups of the flour, salt, cinnamon, nutmeg, candied fruit and walnuts. Add in the remaining flour, ½ cup at a time, mixing after each addition until incorporated. Cover bowl with plastic wrap and set in a warm place. Let rise until doubled, about 1 hour. On a lightly floured surface, roll out the dough into a rectangle, about 1-inch thick. Starting with a long end, roll it up tightly. Place rolled dough on a sheet pan lined with parchment paper and shape into a ring. Pinch to seal ends together. Use a sharp knife to make cuts two-thirds of the way into the dough every 2 inches. Twist each section so that it lies parallel to the sheet pan. Cover with plastic wrap and let rise until doubled again, about 30-45 minutes. Preheat oven to 350°F. Bake coffee cake until golden brown, about 25-30 minutes. Let cool. To make the icing: stir together the sifted powdered sugar, milk and almond extract. Add more/less milk to achieve desired consistency. Drizzle over cooled cake. Garnish the cake with additional candied fruit and walnuts. Can I make the cinnamon coffee cake gluten free? I have always made this as a traditional Christmas breakfast treat. Our daughter is now gluten free for life. Thank you in advance for any help with gluten free assistance. We haven’t tested this recipe with gluten free flour, however you can experiment with the recipe. I would recommend trying one of our gluten free coffee cake recipes found here >> https://redstaryeast.com/recipes/gluten-free-recipes/.